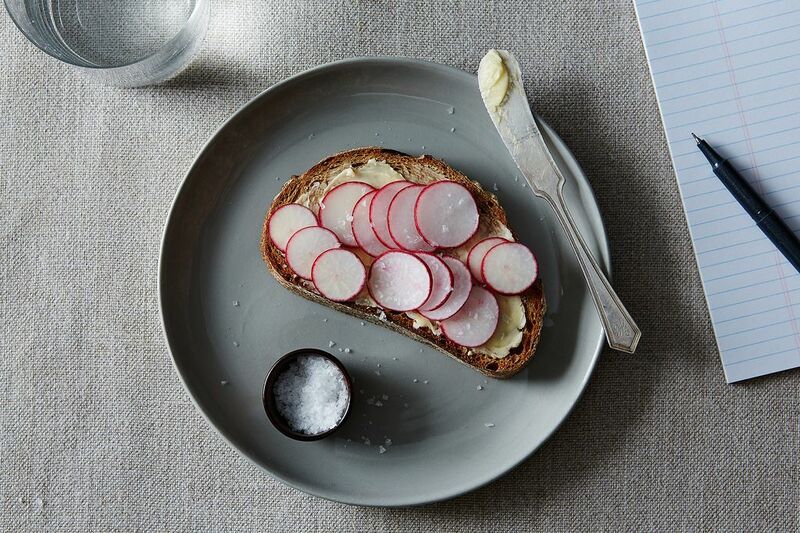 Today: Keep things simple -- and French -- with spring's most perfect lunch: radish tartines with butter and salt. The art of eating lunch at one's desk requires a bit of make-believe: Make believe you are in a fancy restaurant! Make believe you are enjoying a leisurely meal in Alice Waters' garden! Make believe you are in France! If you've chosen option number three and are feeling gallic, a radish tartine is just the thing. All it requires is some good bread, some good (salted!) butter, a few radishes -- your cheapest option at the market these days -- and a few flakes of salt. It is a perfect spring food, and needs no elaboration. More: You could also toss your radishes with white beans and tarragon, for a petit salade. I just googled the French words for "desk" and "lunch" and they are, respectively, bureau and déjeuner. Very elegant! The word for radish, radis, leaves a little something to be desired -- it sounds like something you'd study in geometry, or a typo. But luckily you still have beurre, and sel, and, antithetically, pain, a word whose meaning completely reverses when turned into italicized francaise. Repeat them over and over to yourself as you assemble your lunch, and your bureau will begin to feel like a bistro. You can even make believe that your plastic, cafeteria-issue knife is made of silver, with a decades-old patina. I'll play along. Tell us: What's your favorite springtime lunch to eat at the office? This is a B I N G O ! great farm market staple in June. What is best way to store radishes? This is great with parsley on top too! French? Is that what you call Depression Era food. My mom made this for us all the time when I was a child! Something she picked up from her parents who were scrimping pennies during the Depression. I don't even like radishes (don't judge) -- but this is so pretty that I want it daily. Delish with homemade ricotta too! Alice Waters got into a heap of trouble serving this as an appetizer in her restaurant. It was expensive and so simple that people were wondering why they were paying exuberant prices for it. I, however, think this is delicious and made with the proper ingredients is totally worth it. So interesting -- I can both see why Chez Panisse would serve this, and why people wouldn't want to pay lots of dollars for it. Luckily, it's cheap to make at home! So very French & so very delicious. Love this simplicity.